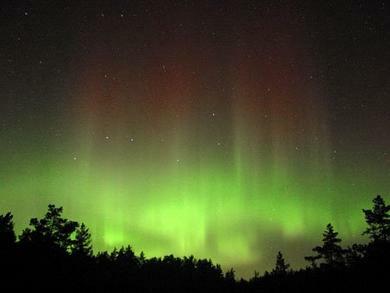 Web of Science: What causes the Northern and Southern Lights? A picture of the Northern Lights taken in Finland. As the effects of solar wind are greatest at a collar round the magnetic poles, the aurora (Northern and Southern Lights) are most visible at those locations. In Iceland we are lucky enough to be within the North Pole collar during the nights, in normal conditions. Changes in solar winds cause the collar to grow or shrink, so the Lights are seen at varying latitudes. An example of this kind of variation can be seen when solar flares send massive emissions of material into space. When the material reaches the earth, the northern and southern collar zones can stretch a long way towards the equator, and there are examples of aurora having been seen at the equator itself. Aðalbjörn Þórólfsson and Ögmundur Jónsson. „What causes the Northern and Southern Lights?“. The Icelandic Web of Science 9.12.2005. http://why.is/svar.php?id=5471. (Skoðað 21.4.2019).